How long would it take for someone to hand-create a tabletop-sized model of Fenway Park? And once done, could it be said that the model is a perfect rendition of the classic baseball park, with all the details there, correctly proportioned? I don’t think you could make that claim; I don’t think it’s possible. But it is possible with a 3D printer. The model will be as perfectly proportioned and detailed as the digital file used as input for the 3D printer. And that’s going to be accurate. The folks at Objet (recently merged into StrataSys) have done just this task. To celebrate the centennial anniversary of the home to the Red Sox, Objet’s Boston office decided to print the entire park. First they got ahold of some of the blueprints from the Boston Inspectional Services Department. Then, along with some photos, they were then able to create an STL file for 3D printing on an Objet Connex multi-material 3D printer. The size of the model they wanted to end up with was too large for the build area of the 3D printer, so they broke up the model in a 3D design program into 40 interlocking parts and printed each separately. Think of a giant 3D jigsaw puzzle. then they just popped the 105 pound model together. 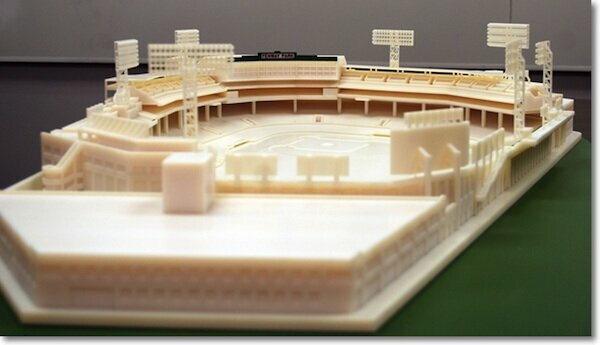 The print resolution of the Objet 3D printer allowed the model to include such noticeable details as Pesky’s Pole, Ted Williams’ red seat, and the Green Monster (including seats atop). It also includes the exact number of lights, concourses, dugouts and bullpens. After a brief tour to show off the Fenway Park model, Objet will donate it to the Boston Sports Museum at the TD Garden.